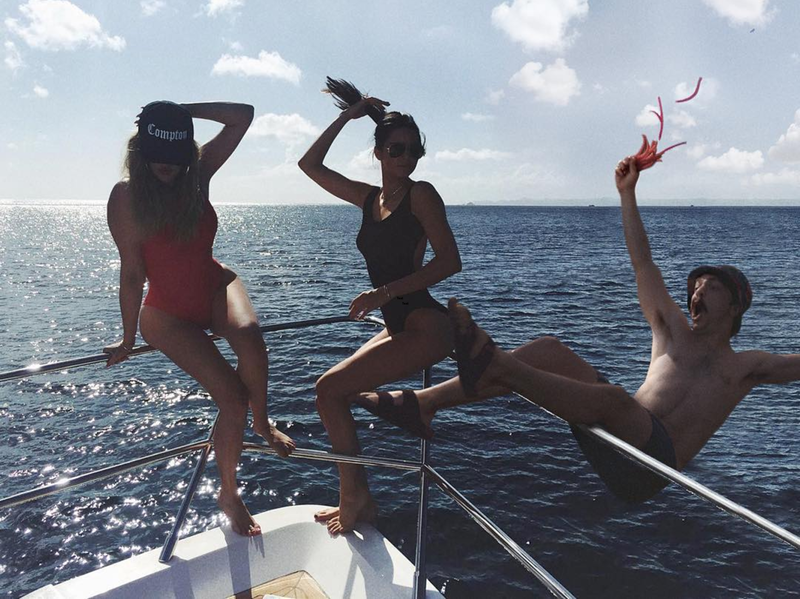 Meet Kirby Jenner, the unofficial brother of the Kardashian clan. Self-proclaimed twin to Kendall Jenner (Kim Kardashian’s supermodel little sister), Kirby has been Photoshopping himself into photos of Kendall for over two years. He takes what would be high fashion, trendy photos and adds hilarious surprises. Inspiration for Kirby’s Photoshopped photos comes from paparazzi snapshots, fashion shoots, or Kendall’s own Instagram account (as shown below). 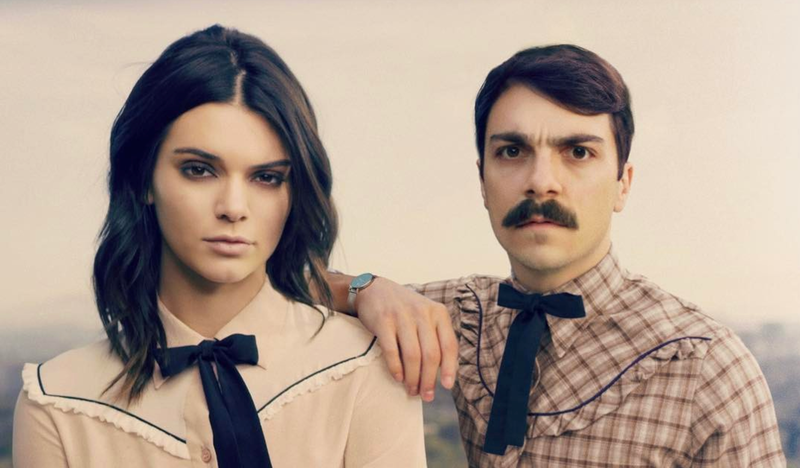 The success of Kirby Jenner relies on the clout of the Kardashian clan. Surprisingly, the family’s social media stardom is lost on far too many people. In case you need convincing, let’s go through the numbers: The most-followed Kardashian is Kim with over 100 million followers. Let me repeat: Over 100 million followers. That means nearly 15 percent of the world’s 700 million Instagram users follow Kim, making her the seventh most-followed Instagram user in the world. 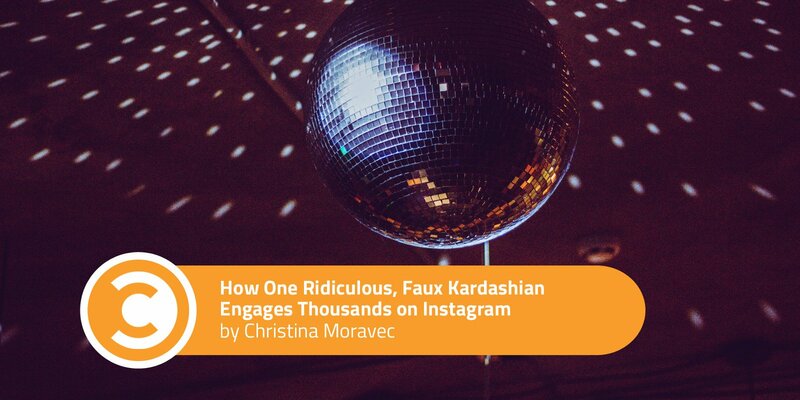 Additionally, each of Kim’s posts earn an average of 1.5 million likes. The family (of seven, not counting Kirby) have a combined following of over 436 million followers, with each of their posts garnering a combined average of 8.8 million likes. If that’s not influence, I don’t know what is. 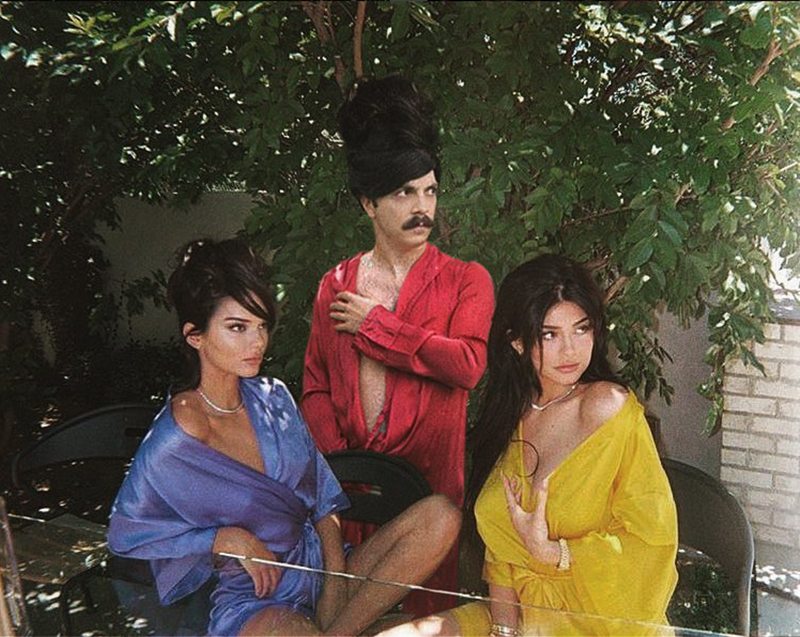 While Kirby Jenner piggybacks on the Kardashians’ stardom, the genius of Kirby is his introduction of this sincere, ridiculous character into the retouched, self-important world of celebrity and fashion. Often, social media materializes a star rather than humanizes them; Kirby’s account does quite the opposite. He has created possibly the only Kardashian to whom we can all relate, while still appearing to live the outrageously expensive life millions of Instagrammers worship. Every move the Kardashians make is in an effort to elevate their lifestyle. After a few hours in Photoshop, Kirby employs expertly-crafted, hilarious imagery to knock their lifestyle down a few pegs, to a more human level, earning him the adoration of a respectable following. Each of Kirby’s posts receives an average of 35,000 likes from his 652,000 followers, ironically earning him the highest engagement rate of all the Kardashian clan at over five percent. With engagement like that, brands may be tempted to offer him endorsement deals. But brands can’t, because who can afford the Kardashians’ improbable endorsement prices? Think about it: Kirby certainly can’t use Kendall’s likeness in his endorsements for brands. Lucky for some, namely Subway, Kirby does plenty of brand promotions for free. A running joke for Kirby is to introduce Subway sandwiches into inappropriate scenarios. Sandwiches have accompanied him through many red carpets events, runway shows, and photoshoots. His audience eats it up (pun intended). Seriously, though, what is funnier than a well-placed sandwich? Is this a sponsorship opportunity for Subway? No, ma’am—not without paying the featured Kardashians a very steep price. These free promos are, however, a wonderful opportunity for Subway to engage. 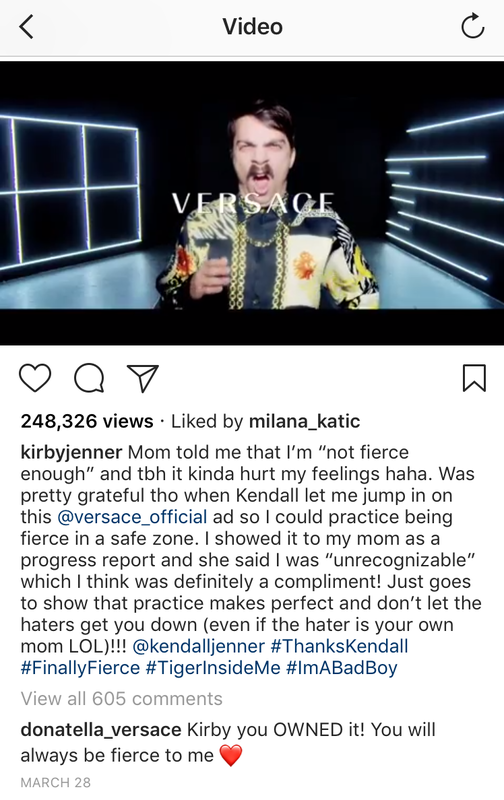 Donatella Versace makes a perfect example of excellent brand engagement in Kirby’s spoof of Kendall’s Versace commercial. When Instagram users have large, active followings, such as Donatella Versace, their comments are featured below posts in which they have engaged. While brands may not wish to sponsor Kirby, they can show their support of the free endorsement by way of a comment. If the brands’ audiences are large, that supportive comment will be featured front and center. Because Kirby’s character inspires such positivity and goodwill, his brand is one in which Subway would be wise to support through thoughtful comments on sandwich-featured posts. In doing so, Subway can build rapport with Kirby’s adoring audience. If you are lucky enough to have influencers like Kirby Jenner endorse your brand, take it seriously, even if their content is anything but serious. Through goofy captions and unbelievable imagery, he has created a character that inspires adoration in a world that harbors plenty of skepticism. In the end, he is successfully doing what all brands are attempting to do on social: garner trust.